China pledged greater defense cooperation with its “iron brother,” especially on counter-terrorism. While U.S. President Barack Obama watched India’s Republic Day parade as the chief guest, China welcomed Pakistan’s army chief, General Raheel Sharif, to Beijing for talks. 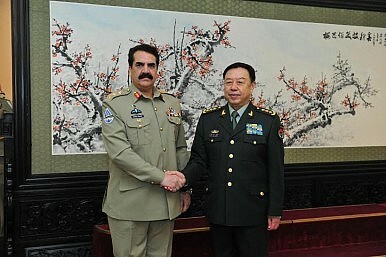 While in the Chinese capital, Sharif met with General Qi Jianguo, deputy chief of the PLA General Staff, General Fan Changlong, vice chairman of China’s central Military Commission, and Yu Zhengsheng, the chairman of China’s top political advisory body, the Chinese People’s Political Consultative Conference (CPPCC). The main focus of the visit was on Pakistan’s anti-terrorism efforts. Pakistan launched a major counter-terrorism operation, code-named “Zarb-e-Azb”, last summer. The military offensive has reportedly killed in part targeted terrorists affiliated with the East Turkestan Islamic Movement (ETIM), a radical group that seeks to create an independent state out of China’s Xinjiang province. China, which grew increasingly worried about Pakistan’s security situation as terrorist attacks on Chinese soil escalated last year, applauded the operation. However, concerns about Pakistani security continue to dog China, both due to worries about stability in Xinjiang and because of the way instability hinders bilateral economic cooperation, including plans for a China-Pakistan Economic Corridor. In the wake of a deadly attack at a Peshawar school, Pakistan’s government promised to double down on its efforts to eradicate terrorism within its borders. During his trip to China, Sharif was expected to brief his Chinese counterparts on Islamabad’s progress in that respect, according to Pakistani media. Sharif was also set to discuss general security and defense cooperation issues with China. The director-general of Pakistan’s ISPR summarized Sharif’s trip in a series of tweets sent on Monday. According to the tweets, Gen. Fan was highly complimentary of Pakistan’s anti-terrorism efforts, calling Operation Zarb-e-Azb “decisive, bold, [a] hard blow [for] terrorists, [and] indiscriminate.” Pakistan has come under fire by some critics for continuing to employ a double-standard when it comes to fighting against terrorism, despite promises from Prime Minister Nawaz Sharif that Pakistan will not draw a distinction “between good and bad Taliban.” Fan’s description of Zarb-e-Azb as “indiscriminate” will be much appreciated by Pakistan’s military. The symbolism of China and Pakistan renewing their friendship while India and the U.S. enjoyed a love-fest was not lost on outsider observers. China’s close historical relationship with Pakistan has long been a stumbling block for closer China-India ties. With Modi injecting new energy into the India-U.S. relationship, China may have been reminding India that Beijing also has other friends active in the region. An op-ed in Global Times rejected the very idea that India and China are at odds. “This fixed pattern of thinking was created and hyped up by the West, which, with ulterior motives, regards the ‘Chinese dragon’ and the ‘Indian elephant’ as natural rivals,” the piece argued. Still, the commentary also warned that India “is sliding into” the Western trap of a “zero-sum game” between China and India. Both Xinhua and Global Times pointedly argued that India needs China to complete its own development goals. China’s embrace of Pakistan may be a subtle reminder that India should take care not to distance itself too far from Beijing. Now is the time for China and Pakistan to step up joints efforts to eliminate terrorist strongholds in the region.